Most nationalities can obtain a visa upon arrival in Jordan (term of validity of the passport at least 6 months). The cost of visa is 40 Jordanian Dinar (starting from 01/04/2014). Currency exchange you can pay on arrival at the airport. 40 Jordanian Dinar correspond to 60 US Dollars. Exception for some countries (check with your tour operator before travelling). Starting from 01/06/2015 tourists who bought a tour from us (Jordanian tour operator), lasting at least 3 nights, we can arrange free visa to Jordan. Request details from us when you purchase tour. The children, who are in the passport of a parent, enter the country with the help of this visa (it is necessary to inform that you are going to the country with a child. The mark is done in the visa). The children who have their own foreign passport (or other document which allows going abroad) will pay a full price of a visa, but it is necessary to inform about the document the travel agency with the help of which you are going to Jordan. A free visa can be got by those who are crossing the board of the country via the special economic zone in Aqaba (via the port). A visa is valid during three months in Jordan. 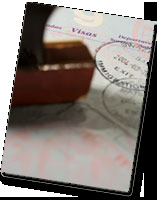 It is necessary to register it at a police station or at the travel agency meeting you in Jordan. The terms of staying in the country will be prolonged free of charge and a corresponding seal will be put. If you do not do these procedures you will be fined when leave the country. A fine is taken for every day of staying in the country without a visa. Departure tax is 10 JOD for every person ( only in the borders) . If you are coming from Jordan through the airport, the departure tax is not charged. There is the change of summer time for winter one in Jordan. The difference between local time and Moscow time is one hour, but because of difference between the dates of changing the time in Jordan and other states, it can be two hours. The time is changed on Thursday at night in Jordan and it is changed on Saturday at night in the other states. From October till March the local time leaves behind Greenwich Mean Time (GMT). The difference is 2 hours. The rest of the year the difference between local and GMT is 3 hours. National currency is Jordanian dinar. There is an abbreviated variant – JOD. The state issues hard cash worth 1, 5, 10, 20, and 50 JOD and ¼ of JOD and ½ of JOD. connected with the appropriate credit system. 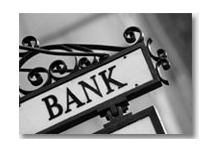 Banks are open from Sunday till Thursday from 9.00 a.m. till 3.00 p.m. Interchanged stations are in all banks and at the most of hotels. Jordanian Central Bank sets rate of JOD to USD and other world currency every day. English, French, German and other satellite channels are broadcasted in all five-star hotels and several four-star hotels. The main daily newspaper in the English language issued in Jordan is “The Jordan Time”. The weekly newspaper in the English language “The Star” is issued every Thursday. Besides, one can buy many foreign (English) newspapers at the hotels and in supermarkets. The telephone service is very reliable in Jordan. It is possible to call abroad from Jordan using any public or private telephone. There are two mobile operators in Jordan – “Zain” (great covering zone) and “Orange”. The price of local calls is approximately 0,1 of JOD per minute, the price of the minute if you speak to America is 0,3 of JOD. Incoming call are free of charge. That is why we recommend you to buy SIM card of the national operator. Using mobile phone, you pay money as for a long-distance call. In several hotels you pay in accordance with the international tariff scale. Besides, in the majority of hotels you pay minimum for 3 minutes irrespective of real duration of the call. If you are outside your hotel and need to make a call within Jordan you may use a telephone in any of the shops. The international code of Jordan is + 962. The majority of hotels and internet cafes are ready to offer you the Internet. In some hotels you should pay for this service, so it is better to get such information beforehand (on the hotel site or at the travel agency). There is water filter equipment in all three-star, four-star and five-star hotels. In 5-star hotels you can get bottles with drinking water free of charge. The water is changed every day. At shops you can buy drinking water at lower prices than in hotels. In Jordan water is priceless. The Jordan government asks everybody to save it. JETT interurban bus service is very comfortable and it connects nearly all populated areas of the country. You should reserve tickets by phone or book them in advance (anyway it is necessary to confirm your travel at the special booking-office at the bus station). The most convenient way of travel is a taxi. It is divided into two types: a fixed-route taxi (white colour) and ordinary one (yellow colour). The latter has a built-in counter. Amman and other cities are known for the high quality of their medical care. All doctors can speak English. In 5 stars hotels when you are sick you can consult a hotel doctor. In Jordan an electricity supply is 220 V, 50 H. Being in Jordan one can use a plug with two knife or cylindrical contacts. If your electrical appliance voltage is different you need a transducer (it is available in any hotel). Despite the well-known opinion, the national cuisine is not very pungent and spicy. Mint, greens and herbs, lemon, onion, olives and cedar nuts are used in it. The national cuisine consists of juicy snack (mezze), aromatic flat bread. Tremendous sweets in syrup, pistachio nuts, mansaf (traditional Jordan dish), lamb with rice and yoghurt creamy sauce – you can try all these dishes in all Jordanian restaurants cooking Arabic dishes. Hummus is a tasty dip of chickpeas with tahini (sesame seed paste), garlic and lemon juice. Baba ghanoush is a dip made of boiled or smoked eggplants and tahini. Ful is made of boiled beans with garlic, lemon juice, caraway-seeds, and olive oil. Kubbe is deep-fried meat balls with spices and bulgur (wheat), onion, cedar nuts. Sambusek is a small pastry stuffed with meat, white cheese (sheep’s milk cheese), spinach or herbs. Tabouleh is a salad that includes mint, bulgur, parsley, tomatoes, onion, and lemon juice. 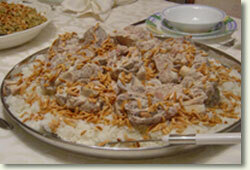 Mansaf is a Jordanian national dish: lamb seasoned with aromatic herbs served with rice. It is cooked in original creamy sauce made of dried yoghurt. Mansaf is cooked and served nearly in all restaurants. Kebab is an original dish divided into several types. It is cooked over a charcoal fire. 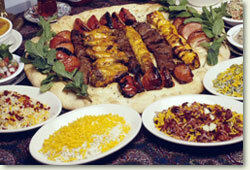 The restaurants serve shish kebab (beef and lamb), shish taouk (chicken), kofta kebab (lamb with spices). Jordanian sweets are the best Arabic sweets. They are pastry with sesame-seeds, baklawa with pistachio nuts, konafa with cheese, gataef, ice-cream, candied fruit and so on. Baklawa (baklava) is made of delicate layers of dough with nuts and sweetened with honey. Konafa is a shredded dough filled with goat cheese, then baked in syrup. Ataif is cooked during Ramadan, it is a special dessert. The small, deep-fried pancakes are stuffed with nuts and cheese. Mamul pastry is filled with nuts and dates. Rose water is added as flavoring. Mohalabia is a milk pudding to which rose or orange water is added as flavoring. the dried tubers of a wild orchid, Orchis mascula), cinnamon and rose water are added to the beverage. in small cups with mint and herbs. Coffee is served without sugar; cardamom is added. Traditionally coffee is taken with a cup of cold water. Coffee is a symbol of national hospitality. So, do not be surprised if shopping you are invited to have a cup of coffee while the salesman is looking for the goods you are interested in. Moreover, you are invited to have a cup of coffee or tea in any Jordanian house. It is not good to reject an invitation. Tea is served in small transparent glasses; fresh mint is added. In Jordan several types of good wine and beer are produced. There are also a lot of foreign types of alcoholic drinks. They are sold in the majority of the restaurants, bars and specialized shops (except Ramadan). One of the most famous national alcoholic drinks is arak, aniseed-flavored distilled drink. Arak is usually not drunk straight, but is mixed with water, and ice is then added. “Rim Al-Bavadi” (“Abraham the Sultan”), “Havara”. All of them are famous for the perfect national cuisine and high level service. Those who have a rest in Jordan are advised to drop in the restaurants “Captain” (it is made in the form of the head of the ship and situated not far from the hotel “Aquamarine-2”) or “Ali-Baba”. and it results in absence of the criminality. Clothes must be modest (mainly women’s). For excursions everyday comfortable clothes and solid footwear are recommended. Short, tight-fitting skirts and dresses, open arms are banned, especially in the down-town of Amman and in the countryside. It is better to wear conservative clothing. You should not wear shorts. Some mosques are prohibited for the non-Muslim to enter. Women should not occupy the passenger seats. Ask permission before taking a picture of somebody. Smoking is permitted in Jordan. It can be banned in the big hotels. Smoking Nargileh (Hookah) is enjoyed in cafes and restaurants. The tourists who smoke can not resist the temptation to try it. Jordanian tobacco is famous for its mildness and aromatic flavor. It is not obligatory to leave a tip but if you do it pay attention to the tip amount. In the restaurants and hotels simply add 10 % to the whole price of your dinner; you should tip a waiter. The hotel servant’s tip is usually 1/ 2 or 1 JOD (2 USD). In the taxi simply add 0,2 of JOD to the counter readings.